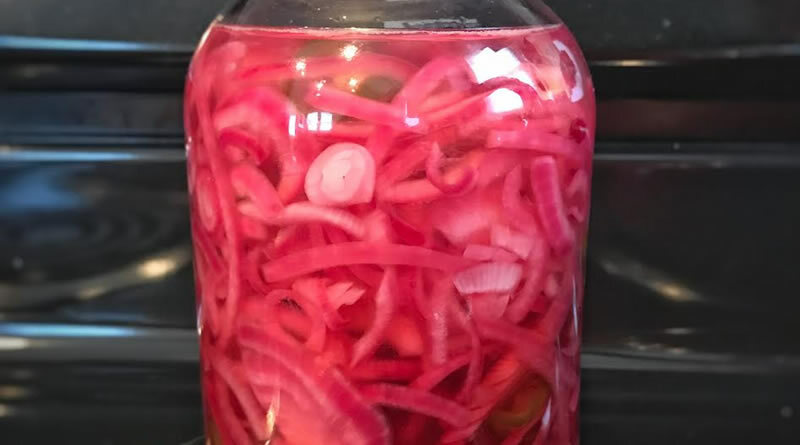 Even if you’re never thought about pickling onions, this is one recipe you’ll want to keep in the refrigerator to go with just about everything from burgers to tacos, sandwiches to salads. Check out our Facebook page for photos of how we’re using these tasty tidbits. Place water, vinegar, sugar, and salt in a saucepan and heat to boiling. While you wait, peel the onion and use a mandoline slicer or a sharp knife to thinly slice it into rings. Cut the slices in half to split the rings, and carefully pack them into a quart sized jar. Pour the pickling brine over the onions in the jar. If you need more liquid, top it off with hot water. Screw on the lid and allow to cool to room temperature. Once you have completed these steps, the pickled onions are ready to eat, but I recommend refrigerating and serving them cold. They’ll keep for months covered in the fridge.